Does this remind you of the 9/11 event at all? The film Geostorm is due to be released on 20th October. 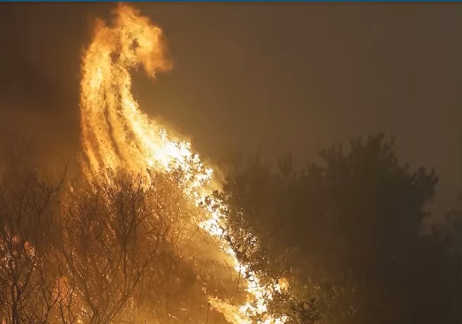 Weird fires 10 October Santa Rosa & Northern CA Fires DEFY THE LAWS of PHYSICS – ‘Truth Warriors.’ Witnesses Confirm California Fires Not Natural! Weather Weapons Used! She tells how, in Sonoma County – ‘The aluminium wheels on cars melted and dripped down driveways like tiny rivers of mercury before hardening. A pile of bottles melded together into a tangle so contorted it looked like a Picasso. Plastic garbage bins were reduced to mere stains on the pavement. Police arrived in the early hours of Monday morning, with loudspeakers barking orders for everyone to leave. ‘– Here are some initial pics I took. Cars melted to the core, yet trees not affected. An entire block torched, yet forests and homes just feet away, untouched… comments all say the same what I saw. Blue flashes in the sky before the fires. This is geoengineering Weather Warfare …flash fires out of nowhere in the middle of the night. In Houston all said the same thing, the “hurricane” was like no other they had ever seen before. .. Orange County is now on fire and comments are very similar. …. 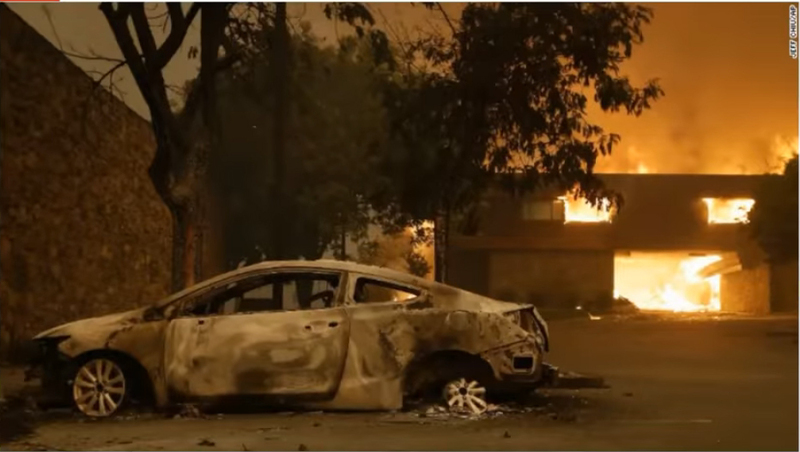 Out of nowhere, fires that came from no lightning and no storm, just intense winds around the event areas while others were left completely untouched. Exhausted firefighters have been battling these storms for a month. September in California: ‘Looking on Google maps, we could see every fire almost lined up exactly, dot dot dot along the mountain ranges, all wind blowing the smoke directly into the population. … it looks like man-made fires, nature doesn’t like up fires next to each other for hundreds of miles, blowing all smoke directly into the population. ‘You are in Santa Rosa?? 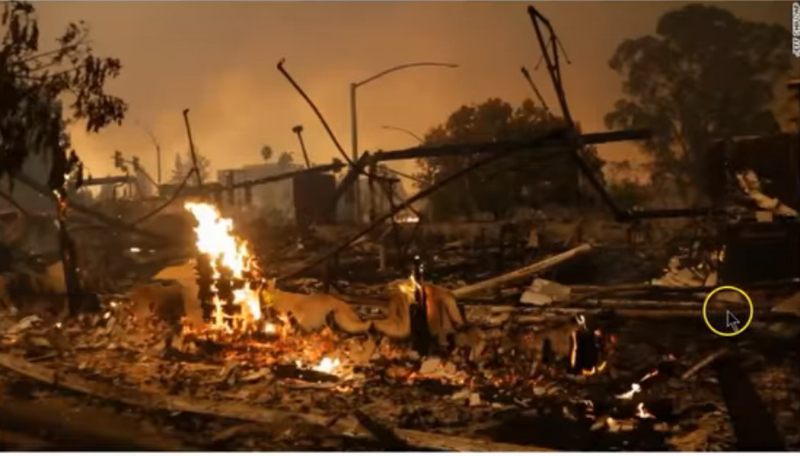 The explosions were unreal … I didn’t leave, I’m still in Rincon Valley, didn’t leave. There was no wind I was working in my driveway all day …. Went to sleep woke up to a phone call and I was in the middle of a circle of huge fires and a gale blowing …. Wisdom Keeper commented: ‘I felt a strange frequency prior to the wind and fires. So did 2 of my friends. It was like a switch that would turn the winds on and off multiple times. This has happened twice before. Once when Hartbin Hot springs burned down and once last year with the winds just swirling out of nowhere. Then a strange energy went through my house as well. It felt like a portal of some sort. This was definitely intentional, and probably something like the HARPSs or directed CERNS. The pace of the burn took firefighters by surprise: the fires torched 20,000 acres in about 12 hours Monday, which Cal Fire’s Cox called ‘a phenomenal rate of growth.’ More than eight million acres have burned in at least four states, raising questions …. Does a forest fire, at 2 am, look like this? Aluminium nanoparticles, which have been sprayed for decades in chemtrails, may assist the spontaneous fires. Toasted cars, bent metal .. remind you of 9/11? Baffled experts are calling it ‘dry lightning’ that ignites these fires…. I thought this stuff only happened in Stephen King novels? Anyhow, post a comment!